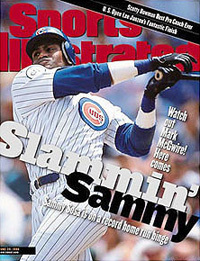 After living in the national TV spotlight for the second half of the 1998 season, as he joined in lock-step with St. Louis Cardinals first baseman Mark McGwire in their spectacular pursuit of New York Yankee great Roger Maris’ single season MLB home run record, one would think that Slammin’ Sammy Sosa would have been immune to the pressure of hitting landmark home runs. But after sitting on 499 long balls for the entire 2004 off-season, Slammin’ Sammy one of the most excited members of the Cubs squad visiting Shea Stadium for a season-opening series against the Mets. Much to the chagrin of Sosa and legion of Wrigley Field faithful who traveled to New York to cheer on their hero, #21 could not muster a single homer in the series. “I might have been trying to little too much, and I just missed hitting a couple out,” Sosa was quoted as saying before traveling to the next leg of the road trip in Cincinnati. His luck changed during the Cubs first game against the Reds, who were enjoying their inaugural home stand of their brand new Great American Ballpark, when on April 4, 2005, he crushed number 500 off Cincinnati Reds’ reliever Scott Sullivan in the top of the seventh inning. Sosa's got all of a 1-2 fastball at the knees and he ripped it over the right-center field wall. 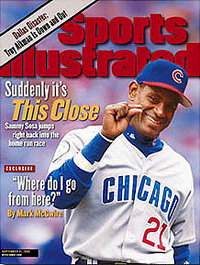 Sammy Sosa’s 500th home run was a foregone conclusion for many baseball fans, and paled in comparison to Barry Bonds’ #615, which came on the very same day, but that didn’t diminish the significance for Sosa, who took extra pride in being the first Latino player to achieve the legendary plateau. 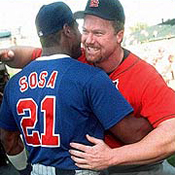 “When I made contact I was like 'Wow, I knew I got it, that's it, that's (number) 500," a joyful Sosa said after becoming the first Latin American player to join the fabled 500 Home Run club. "When I got to home plate I thanked God because I don't have to think about it anymore," Sosa added. “I don't have to go up there every at-bat thinking of hitting the ball out of the park." Upon reflection Sosa added, “This (hitting #500) was very special for me, especially since my family was here watching. That's something that I never will forget." Cubs Manager Dusty Baker, who watched Sammy Sosa make history, said it was like deja vu. "The very same day Sammy hit 500 is the same day and in the same city that Hank (Aaron) hit 714 and I was here for both of them," said Baker who in April of 1974, was on deck when Hank Aaron hit home run 715 to pass Babe Ruth in career home runs. “I've been very fortunate to see some great milestones, starting with Hank Aaron right here," Baker said. "I've seen Barry Bonds hit 400, 500 and 600 [as coach of the San Francisco Giants], and I feel fortunate to see Sammy hit his 500th and I hope I get to see him hit 600, 700 and beyond."